topsuccesssite » Work Hard, or Go Home! 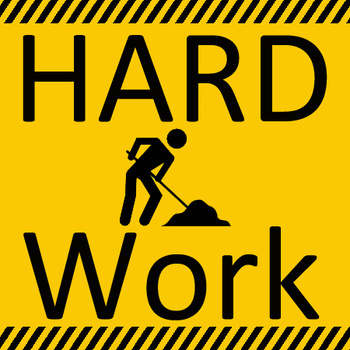 Work Hard, or Go Home! If you are one of those people who half does everything you do, please just do us all a favor and stay home. If you have not heard yet, effort is everything these days, and if you think your co-workers have not figured you out yet, you are wrong. They know you are lazy. They know you don’t do an effective job, and they know you are a fake. They knew a long time ago, most of them have just not told you they know. Oh, by the way, chances are your boss knows as well, and he or she is just biding their time until they can figure out what to do with you. Should you be embarrassed, YES! if you want to ever be looked at as a successful at your job or to be a successful person then you have to take serious action when it comes to your effort. One of the first steps to becoming successful is being grateful for the opportunities you have and working hard to advance and in turn get even better opportunities. Successful people are not slackers. They take pride in their hard work, and they focus on being the best they can be. They care about the perception people have of them. They work towards a goal and want to be the best they can be. Last but not least they are honest with themselves (Rule #4). I know the old saying work smarter not harder, but anyone who is truly successful, it takes serious hard work as well at times. There are really only two options you have when you show up to work each day. Be the best you can be and give your best effort, or choose to be lazy and continue to keep yourself from ever achieving your true potential. If you choose the first option, let me know how I can help you. If you decide to go with option two, then do us all a favor and please step out of the way so the people who plan on going somewhere in life can get by you! News flash, lazy people tend to just take up space. Lazy is just not acceptable! For the best free success advice from the top success blog go to www.Topsuccesssite.com!